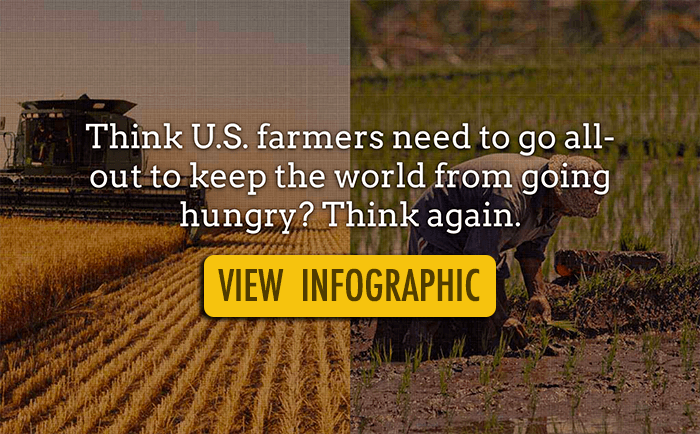 EWG > Agmag > Think U.S. Agriculture Will End World Hunger? Think Again. The implication is that people will go hungry if American farmers don’t go all out to increase production of crops and livestock. Before we accept this deal, we should know which “world” U.S. farmers are actually feeding, which was studied in a new report out this week. U.S. exports go to countries where people are rich enough to buy them. The top 20 export destinations, including Canada, China, Mexico and the European Union, received 86 percent of the total value of U.S. agricultural exports last year. The United Nations Development Program indicates that all these nations had medium, high or very high human development scores, and none had high rates of hunger. The 19 countries that, according to the U.N. Food and Agriculture Organization, are experiencing high or very high undernourishment, such as Haiti, Yemen and Ethiopia, received only half of one percent of total U.S. agricultural exports last year. In 2013, U.S. food exports and aid made up only 2.3 percent of the food supply for the 19 hungriest countries. It’s great that growing wealth around the globe creates promising business opportunities for American farmers. But taking advantage of these opportunities doesn’t have to inflict the damages of “modern” agricultural practices on our country’s environment and public health. It would be different if American farmers could, in fact, end world hunger through all-out production, without regard to health and environmental costs. But they can’t. Until we solve these fundamental problems, we won’t feed the whole world. We’ll just feed the already fortunate.